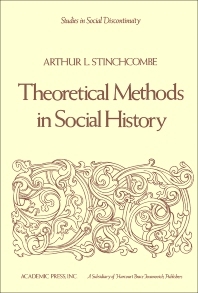 Theoretical Methods in Social History examines how generality can be wrested from historical facts. The book explores the various aspects on the application of social theory to historical materials. Chapters delve on various historical issues such as the sociological bias of Trotsky and De Tocqueville; functional analysis of class relations in Smelser and Bendix; and the analogy between intellectual productions. Historians and philosophers will find the book interesting. Authority and Inequality or "Justice"
What Makes Human Actions Analogous?